Immediately, I started to check possible flight combinations to reach Sal. It looks easy, as the Canaries are really close, but the flight companies that fly between the islands don’t take windsurf equipment. After 1 day looking for all possibilities and organising my gym finding someone to replace me, I bought the most expensive tickets of my life. It’s was like the same cost as to go to Hawaii. But I didn’t mind, I wanted to be there at the right time! The day before, it was time to prepare boardbags, medicine for the cuts and sea urchins, duck tape and poxipol for the rocks…hahahah. 23 hours of flights later and I finally arrived to Sal, after 11 years without being there. Last time I’ve been in Sal it was quite deserted and a kind of third world country. One day before leaving we suffered a robbery, which was a nightmare, but in the end we could fly back home. Today Sal is much more developed, with a lot of services and possibilities. It’s another world now. Safe, with a lot of places to stay, good food, nice people. But on the other hand it is more crowded. All the spots are full, every session is a fight, especially with the kiters. In 2008 I destroyed 2 sails in 20 minutes in the shore break. I was afraid of it, and I didn’t want to be the first to go in. The wind was super light, but I rigged and started to get ready. I was there to go. While I was rigging Josh Angulo (Angulo Boards / Challenger Sails) arrived and started to rig too. I went to the beach fast to be there with Josh and study how the most expert sailor of this spot managed to pass the shore break. But suddenly I saw him going in from the rocks, avoiding it. He was not lucky, he broke mast and sail, on the first run. After waiting for a while and looking at the sets coming in, I decided to give it a try. This was the moment… I was shaking… Once I sorted to pass the shore break, a big set came in closing all the bay. I didn’t do a nose dive with the sail. I could keep the sail in my hands and managed to sail away. I was in!!! Beginner’s luck. The wind was really light, gusty and with gusts changing from side to off shore. But as I was alone, I managed to surf a few bombs. I sailed the easy way, not to finish on the rocks during the first session. But it was a fun session. After a while the wind turned more offshore and it was almost impossible to take any wave. At the end we had to go through the shorebreak without planing on a wave. Imagine, another “funny” moment. Shaking again. Everything finished perfectly, without damages. For the second session we moved to Canoe, a spot located between Ponta Preta and Ali Baba. Ali Baba was huge and full offshore. When all spots are 100% off, here is the only spot with possibilities to sail. We arrived at the beach and it was looking quite tricky, with some lines closing from one side to the other. But it was windier than Ponta Preta. I rigged my 5.0 and I had a fun session. It’s an easy spot. With low tide there are some sea urchins on the beach, but less than Secret and Ali Baba. The wave is quite soft but at the end it has a little bowl for some nice aerials. For sure there are also rocks, but less than the other spots. If you lose your equipment it can survive. We decided to go early to Ponta Preta, before the kite event started. It was 8am and when we arrived there were already 3 kiters sailing. Again, I was the first windsurfer to go in, but I was more confident with the spot. The wind was better than the first day and we could have a short but amazing session. At 9 am the organiser asked us to get out, because they where starting with the kite contest warm-up. Second session at Ali Baba. It was more than mast and a half, a few sets 2 masts, connecting from the outside to the inside. After few minutes, Kai Scored a wave all the way in. He was on fire screaming!!! What fun! He went out and gave me a few tips for the wave. Actually, the waves were probably the biggest I’ve ever surfed. Ali Baba is a really fast wave with different sections. You start with a water mountain, sailing down wind to get into the wave. When the wave arrives at the corner, it starts to get some shape, becoming vertical. First section is where you can do a few turns. After that you must start to head down-the-line at full speed. As soon as you pass the first fast section you think it will be more quiet, but it isn’t! The wave loses some height, but the last part of the wave starts to build, faster and more shallow. It’s pretty easy to go to the rocks if you are not fast. Then you can sort out, arriving at the easier and fun beach wave, where the wind is a bit more side shore. At the end, I managed to sail a few ones all the way in. It’s a pure adrenaline wave! Ponta Preta was perfect, but they were competing with the kite event. So we decided to move to Ali Baba. It was smaller than the day before but windier. 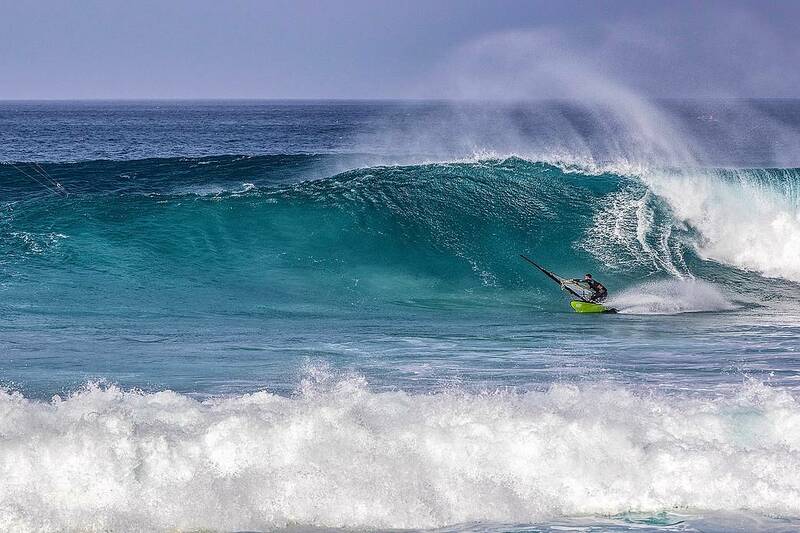 I was really powered up on the wave with my 4.7, but I didn’t have smaller sail with me. I’ve always been in full planing. I took 3 – 4 waves. After having lunch the wind and waves dropped, but there was still some swell so we decided to go for a floating session. It was light and small. To catch the wave we needed to be almost on the rocks before the corner. The wave was quite small, but as soon as you sorted out a few rocks and sections you could ride the wave with some turns. As soon as we started I realised we will finish on the rocks. Once a big set came in Victor and me were close to go and visit the rocks. After 2 waves I went out of the fast section because I couldn’t pass it, and after that a bigger set was coming! I tried to push the mast as deep as I could but it was really shallow, maybe one and a half meter. I ended on the rocks with a few holes on the board and on the sail. And obviously sea urchins in my feett. The Ali Baba reef finally gave me the welcome. That day Victor also finished on the rocks, but he was more lucky than me without breaking anything. Forecast dropped and Ali Baba wasn’t working. We went for a small session at Canoe with the 4.7 and it was fun. The wave was small but breaking on the shallow reef and quite powerful. Perfect for some aerials. The kites were still competing. They had to finish the double elimination. I decided to go really early in the morning and give a try. I woke up at 5:30am to be ready at the beach at 6:30 am. I couldn’t believe it, there were 3 kites already in the water. At 7am I had my 5.0 and 93 ready and I went for a nice session. The tide was low and the waves were opening better. I had a few nice ones with some aerials. But at 8:00 I had to get out because 8 kiters were warming up for the double and it was a nightmare to catch a wave. After that session I moved to the north. I went to Fontona. It’s a spot near Palmeira. Its wave has the peak on the outside and there’s a big bay with a beach. It’s really easy to go in and out. You have flat water inside and a mast high wave breaking on the outside. But the wave breaks on the rocks and if you go too deep you can destroy everything. When I arrived it was working and looking on fire. I rigged the 4.7 and went for a full planing session. Unluckily the wave dropped and I couldn’t ride many waves, maybe only 4 nice ones. The waves were breaking on the rocks and it was simply too risky. After lunch I went back to Ponta Preta to check the condition and the wave was breaking on the inside and on the left, but not on the peak. The left was huge, more than a mast. But the right wasn’t that good. It was looking like the swell was more westerly. We moved North again looking for a better spot because we were sure that somewhere it should work. Ali Baba was the spot. It was completely off shore but the wave was incredible, opening perfectly. And I went for my last session here in Sal. The sunset session.